An overwhelming majority of employers, including those that currently offer employee health coverage and those that don’t (81 percent and 71 percent, respectively), would prefer a private health insurance exchange to a public one, according to a 2012 survey by Booz & Company. How do private exchanges differ from public ones, and what advantages do they offer employers? The health insurance marketplaces, or exchanges, created by the Patient Protection and Affordable Care Act (ACA) allow individuals and small employers to fill out an application and see all the health plans available in their area. Through technology, the marketplaces offer individuals and small employers choice among several insurance plans, and an easy way to compare them. But the marketplaces are open only to employers with 50 or fewer employees (although some might expand eligibility to employers with 100 or fewer employees in the future). Private exchanges seek to give other employers these advantages, along with some others. Private exchanges emerged a few years ago when large employers such as GM and others struggled with the increasing cost of providing retiree health benefits. Instead of buying a specific health plan for retirees, employers instead make an annual contribution to each eligible employee. Employees then use that contribution to buy their preferred Medicare Advantage or Medicare supplement and Part D prescription drug plan in a private exchange. This defined contribution approach to funding retiree health benefits gives employers greater cost control and predictability. Meanwhile, employees can choose the plan that best meets their needs, using the decision support tools offered by the private exchange. Private exchanges are created by private businesses, rather than government fiat, so many models exist. Some offer the products of only one insurance carrier. Others, typically created by brokers or consultants, offer the products of multiple carriers. Although the market is rapidly expanding and changing, an employer looking for group health plans for active employees will likely find more options among single-carrier exchanges. 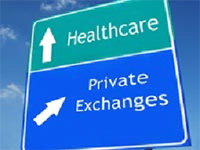 Like the ACA’s health insurance marketplaces, private exchanges allow individuals to compare and select among various health plans. But in addition to providing major medical plans, private exchanges can offer a range of other products on a voluntary basis, including dental and vision plans, life insurance, hospital indemnity insurance, cancer or critical illness insurance and disability insurance. A defined contribution approach allows employers to set a predictable budget for their healthcare costs. Exchanges encourage employees to buy only the benefits they need. Interestingly, employees given a choice of benefit plans on a private exchange tend to choose less-rich benefits than their employer might have offered previously. One private exchange operator says most employers save 10-30 percent in the first year alone. Defined contribution plans can control healthcare spending increases by giving employees more transparency and control over their healthcare spending. Exchanges can pool risks among many employers. This spreading of risk reduces the impact of a catastrophic claim on any one employer. As multi-carrier exchanges emerge, they could foster competition among insurers, making them more efficient. Exchanges can offer a variety of benefits on a voluntary basis, eliminating the need for employers to deal with multiple carriers. Web-based enrollment tools feed enrollment data directly to the insurance carriers, eliminating paper applications and minimizing billing reconciliation. Employers can use their insurance broker to facilitate buying coverage on a private exchange. Employees who select their own coverage tend to be more satisfied with their plan. Employees who have access to voluntary benefits through an exchange can have a one-stop benefits shopping experience. They can use the decision-support tools of the private exchange to select other coverages they want and need. Many private exchanges offer web-based enrollment tools that allow employees to instantly see their elections and the costs, then easily make changes to fit their budgets. Employers that buy their coverage on an exchange will not be able to obtain the tax credits available on the public exchanges. Lack of uniformity means employers (or their brokers) must do legwork to determine which exchange offers the combination of products and service that meets their needs. However, the variety of models available gives employers more options. When the “employer mandate” goes into effect in 2015, employers subject to the Affordable Care Act will need to ensure their health plan complies with the provisions of Affordable Care Act (ACA) or face possible penalties. Employers that use private exchanges for retiree health benefits typically use health reimbursement arrangements (HRAs) to fund retirees’ health plan purchases. An HRA, funded solely by the employer, provides tax-free reimbursement of qualified medical expenses, up to a maximum dollar amount per coverage period. Because HRAs have a maximum dollar amount for a coverage period, they do not comply with the ACA’s prohibition on annual dollar limits. The ACA prohibits any group health plan from placing an annual dollar limit on coverage of “essential health benefits,” but it specifically exempts standalone HRAs limited to retirees from this prohibition. For active employees, however, the annual dollar limit prohibition means employers cannot use HRAs to fund benefits unless they are integrated with another group health plan. Coverage under that group plan alone must comply with the annual dollar limit prohibition. Employers turning to private exchanges will also want to ensure they give employees enough money to buy coverage to avoid triggering the ACA’s affordability standards. Their plans should also comply with the ACA’s preventive care and minimum value coverage requirements to avoid triggering penalties. Despite the challenges, many experts predict private exchanges will become employers’ preferred way of buying coverage in the future. For more information and to learn about USI’s private exchange solution, please contact us at 212-842-3400. ← Business Insurance: USI moves HQ to Valhalla, NY; names Bascio senior V.P.